Management Science Associates is looking for a Software Developer to intern for them in Pittsburgh. Management Science Associates, Inc. (MSA) is a diversified information management company that for over half a century has given market leaders the competitive edge in data management, analytics and technology. Students can apply on the MSA website here or through the ColonialTRAK website. Students must apply by Saturday, May 27th. This entry was posted in internships, job opportunities on March 30, 2017 by John Counihan. The Bayer Corporation is looking IT interns to start on May 1st, 2017 in the Pittsburgh area. Bayer is a global enterprise with core competencies in the Life Science fields of health care and agriculture. Its products and services are designed to benefit people and improve their quality of life. •Work with senior members of the team and assist with tasks of low to medium complexity. • Self-leadership demonstrated by initiative and positive approach to tasks, decision-making. For more information, view this link. To apply, click here. This entry was posted in internships, job opportunities and tagged Bayer on March 27, 2017 by Joshua Manuel. 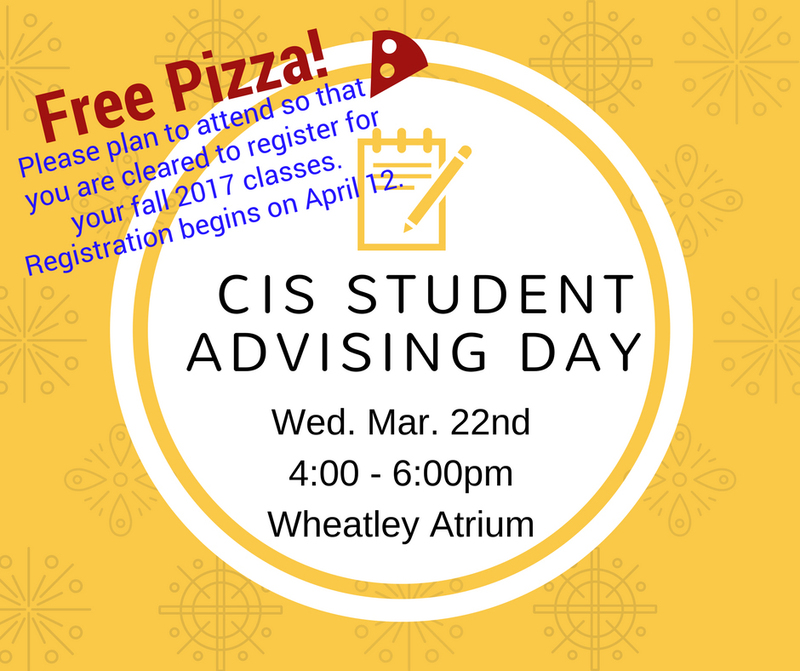 Come to the CIS Student Advising Day so that you can be cleared to register for Fall 2017 classes. It will be held in the Wheatley Atrium on Wednesday, March 22nd from 4-6pm. CIS faculty will be available to assist you with scheduling. As always, you can also contact your academic advisor for a private one-on-one meeting if you prefer. Free pizza will be provided at this event! This entry was posted in events, registration, reminders and tagged CIS Student Advising Day on March 21, 2017 by Dr. Jamie Pinchot. IT/Technical Internship at DVSport, Inc. The company DVSport, Inc. is looking for IT/Technical interns to work for them part-time throughout the Spring and Summer. DVSport, Inc. is an agile software company founded in Pittsburgh, PA in 2002 specializing in digital video acquisition, analysis, and play-back software designed specifically for the sports and medical markets. DVSport interns will work in a dynamic environment that is reflective of the fast paced operations of their company. Interns will work five days a week, up to eight hours a day. The wage is up to $10 per hour. Assisting with the building and maintaining of hardware for client use. Testing and loading company software onto client hardware. Exercise quality control measures for all equipment before implementation by clients and DVSport staff. Assist with inventory control from all points of product life cycle. Assist with logistical needs and ensure quality control procedures in shipping/receiving. Commitment to providing the best experience for clients. Entering junior or senior year/nearing completion of their degree program. Majoring in Computer Science, Industrial System Engineering, Information Technology, Computer Engineering, related IT or Engineering discipline, Supply Chain Management, Sports Management, Business Administration. Demonstrate working understanding and knowledge of the IT field. Ability to work under and meet deadlines. Ability to lift objects upwards of 50 lbs. Willing to live and work in the Pittsburgh area for the duration of their internship. To apply, please go to internships.com and search for “DVSport” or click here. For more information about the internship, go to the ColonialTRAK website. There are eight openings available. This entry was posted in internships, job opportunities on March 21, 2017 by John Counihan. McKesson Pharmacy Technology & Services is looking for a “Six Sigma Intern” to work in their internship program. McKesson provides technology that supports pharmacy operations and patient care through operational workflow, clinical programs, 340B program management, and inventory optimization. McKesson’s Undergraduate Intern program provides the intern with an opportunity to experience the healthcare industry first-hand. This is a hands-on opportunity to gain practical experience in a dynamic and growing business. This a paid internship that involves part-time and/or full-time work. The average work day will last eight hours. The internship will take place in Moon Township. Each intern is assigned a project-focused opportunity on a current targeted goal within the McKesson Pharmacy Technology & Services business. Complete online Yellow Belt Training. Develop Project Charters and Business Cases for potential future Six Sigma projects. Support Black Belts in administering the Six Sigma Green Belt Program. Coordinate with finance to ensure that project improvements are tracked, monitored, and trended for an appropriate time period. Must be currently enrolled in a Bachelor degree program applicable to Accounting, Finance or MIS and entering your Junior or Senior year. Willingness to learn, develop and contribute in a fun, fast-paced environment. Self-starter that brings both interpersonal skills and creative problem solving skills. High degree of personal initiative. Applicants are encouraged to visit McKesson’s booth at the RMU Career Fair on Thursday, March 23rd from 12 – 3pm. They can also apply through McKesson’s website. For more information about the internship, go to the ColonialTRAK website.